Fellowship studies in Royal College of Surgeons (Glasgow), the speciality being Cardio Thoracic Surgery. Expertise in the field of cardio-thoracic surgery, having performed over 25000 cardiac surgeries. Association with global organization like mending kids international, USA international children’s heart foundation, USA etc. Founder of Hrudaya, cure a little heart foundation that has been ascribed with the benevolence of having extended cardiac procedures and cardio thoracic procedures to more than 3000 children. Extended cardiac surgery services to children in developing countries such as Ethiopia, Libya etc. 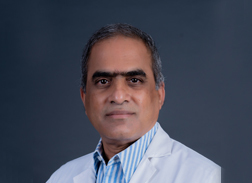 Awarded the “Best Doctor Of The Year” in the year 2005 by former director of NIMS. Awarded TV5 “Business Leader Of The Year” in 2013 by Sri Nallari Kiran Kumar Reddy CM of AP.